This is book 2 in the Replica trilogy by Jenna Black. I unfortunately didn't know that before reading it or I may not have read it as I do not care for starting a trilogy on the second book. I thought the story was good. I especially liked the fact that this is a young adult novel with a gay main character and with the writing style this is approached in a nonchalant way. The fact that the main character is gay means nothing to the story, of course, there are complications that can arise from this fact but this is not a focal point of the story. It is merely a fact and I personally feel that is a fantastic step in the right direction where equal rights and society views begin. The story is futuristic with an old school feudal system which is interesting to say the least. I have not read the first novel, however, there was quite a lot of reflection on the first novel which did allow me to get a good idea of what happened previously. I would like to read the first and last novel. This did leave at a cliffhanger ending and I would like to find out what happens. The characters are well developed. The story, despite sounding quite complicated, was actually very simple to understand considering I didn't read the first book and have an excellent understanding of the story. 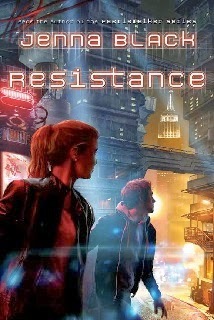 I really cannot advise reading "Resistance" until you have read "Replica," which is the first book in the series but if you decided to read "Replica" and "Resistance" I can tell you Resistance is very good. Disclosure: All opinions are my own. I received Resistance at no cost for the purpose of this review. No other compensation was received.